Abigail Bosanko – Reading, mostly. ‘The Power’ by Naomi Alderman is darker than the News. Why is this good writing? A little bit of analysis. Men Do Read Books By Women, Apparently. Conversation with my husband: ‘Lionel Shriver,’ he says, looking at our bookshelves. ‘I’ve read Lionel Shriver. Jeanette Winterson. Diana Athill – she’s really good. Sally Vickers, Barbara Vine. I’ve read loads. I’ve read loads of women’s books – books by women, sorry.’ I have told him my theory about why men don’t read women’s books…. 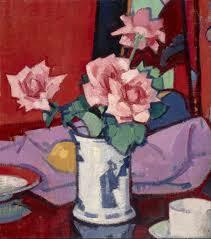 I love this painting by Scottish Colourist, Samuel Peploe. It’s in the Gallery of Modern Art, Edinburgh where it also features on menus in the café. It’s a picture that’s easy to love but it’s the lemon that really makes it work. Without the lemon, it just wouldn’t do it for me.